When we do anything creative, we're asking ourselves to make lots and lots of decisions. Some of those are the obvious, visible kind (what colour should that be? Is that the right word? ), and some are less tangible, the instinctual decisions we make without even realising (like when we place a mug on a flatlay photograph without really thinking about it). All of those little conscious and subconscious choices are part of the reason creativity is both super fulfilling and inexplicably exhausting at the same time. By simplifying some of the other areas of our day-to-day, we can help cut out some of the extra decisions we make along the way, giving over more energy and headspace to the creative things. Minimalism is, to me, not about the typical bare and pristine aesthetic popular on pinterest. It isn't white floorboards and chic monochrome furnishings. It can be all those things, for sure. But it's also more than that, it's about creating an environment and lifestyle where the things you surround yourself fill you with energy and happiness, but don't overwhelm you or stress you out. 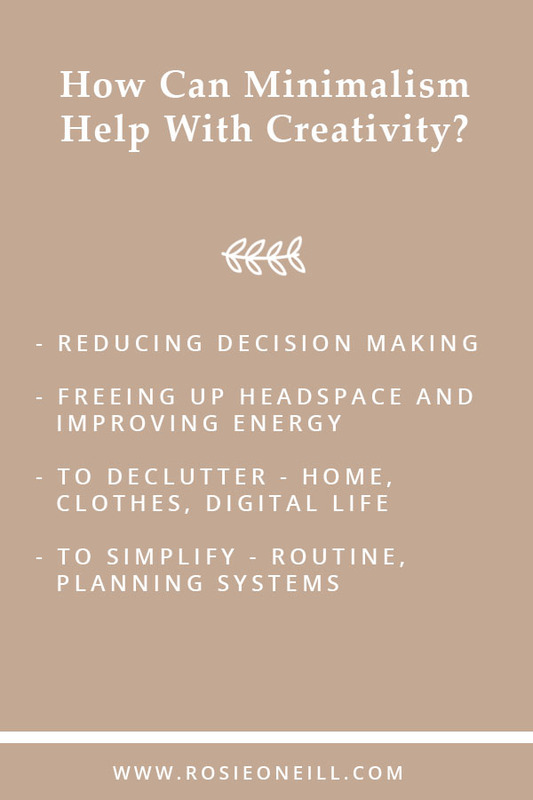 If we can clear the clutter from our lives in a way that is sensitive to our personal tastes and tolerance levels, we can free up that space (mental and physical), and build a life that has more room for creative projects, self care, and simple mindful enjoyment. - Your home. Creating a pleasant, clean and inspiring environment can be one of the simplest tricks to improve energy levels, positivity and motivation. - Your digital life: the people you follow online, the apps you use, the emails you receive. All of these play a huge role in the information and voices you consume regularly, and really feed into your mindset - so be mindful that your consumption is valuable and not just noise. - Your clothes: work clothes, sleepwear, exercise gear. Simplifying these can make getting dressed less stressful and more comfortable. Working out what you actually like, and what makes you feel good is also a great way to get to know yourself better too. - Your routine: how you get ready in a morning, what you do before bed or on your commute, how you spend your lunch break. If you can make something in your routine more efficient, you could consider using the extra time to journal, read or meditate. - Your planning/to-do's. The way you plan anything can really help minimise unnecessary decisions, whether it's a meal plan to help with the week's cooking, or even just a simple plan of the week including all the boring but essential adult things. Having a good plan and sticking to it means you don't have to feel distracted or overwhelmed when you're trying to concentrate on a creative project. What could you simplify in your life?